I had to smile when I read this recent post by Inelia, since I felt led to offer a Timeline Tune-In and Tune-Up special during May 2016. It seems I’m not the only one noticing all the fluidity and possibilities right now. Inelia goes into detail about some of the physical effects of making unprepared (or even consciously chosen) timeline leaps, and I find that the more consciously prepared and intentional the shift, the gentler the body changes. As the densest aspects of ourselves, our bodies tend to prefer slower, less radical transitions, but sometimes the body requires a very quick timeline jump in order to recover from a disabling disease or life threatening injury. Sometimes the soul wants out of a situation so badly and for so long that the fastest and easiest route from here to there involves some seriously non-linear action. In any case, I love a well executed timeline jump, because I’m an impatient little faery in my personal life, and collectively, we don’t have “time” to mess around anymore. Given an opportunity to create and embody heaven on earth, why would we continue to flirt and dance with doomsday scenarios? Given the chance to bring beauty, health and rejuvenation into being, why would we settle for anything less? And here’s a link to the Timeline Tune-In and Tune-Up special if you decide to hop, skip and jump your way to preferred realities. This is such a timely post from Dana, particularly after my PA Round 2 trip of emptying my parents’ old house of 30 years and preparing it for sale. On my first stay, I lost count of how many carloads of belongings we took to Goodwill, and Mom took even more after Inleft. So much that she received a personal, gleeful thank you from Goodwill for all the high quality donations. Much of the emptying process occurred before I arrived on May 11, but even that came about via careful consideration and search for help. A professional organizer gave my mom a list of people who haul away usable items for donation, places that ethically recycle electronics, and where to call for other recycling and reuse options. My mom has been recycling for most of my life, and she feels very proud that so little of that house full of stuff went anywhere near a landfill. I did a Reiki Healing Attunement for all the stuff to find its new humans, and later that day, Mom called in wonder about how things were flying out the door. Just the right people showed up wanting what she had — no garage sale necessary. A hazardous waste collection day coincided with the morning I flew home, and that felt like a symbolic send off. 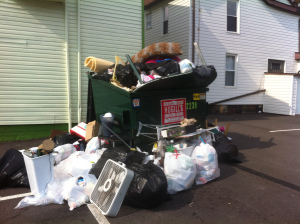 That house could easily have filled dumpsters, but instead filled hearts. When we live in flow, honor the Earth, things find their rightful new homes. Habitat for Humanity’s ReStore got a 2015 grant to recycle latex paint into new paint for homes; a local doctor makes quarterly trips to Haiti to deliver medical supplies and caregiver packages, crutches, walkers and canes for those who desperately need such things; the list goes on. My point is that an overwhelming task ended up bringing my mom great joy by helping so many others without destroying the planet. We can each do our part, and an entire economic stream can flow from “waste” — a stream that meanders in harmony with the power of giving back in positive ways instead of thoughtless expectations of other people — or other generations — to clean up our mess. A typical “trash” pile full of perfectly good stuff from the move out day ritual. Working fans, mattresses, bags of unused clothing, shoes, organization units, dishes, etc. Some folks might wonder why this article didn’t come out on March 16, 2015. After all, that was the date of the seventh and final exact square of Uranus and Pluto, and the previous articles in this series had all come out in a timely manner. Perhaps this one didn’t come out until May of 2016 for the same reason that almost no articles were written over the last year and a half: I have been busily integrating and living the energies of the Uranus/Pluto square. Perhaps a lot of readers can relate, having found themselves living in Transmutation City, wherein our old “realities” have been getting systematically shredded – or perhaps in some cases, delicately dissolved. The seven exact squares may be a little more than a year behind us now, but Uranus and Pluto have still been squaring each other this whole time. Celestial bodies do not have to be separated by exactly 90 degrees to be squaring each other. Astrologers vary on how much “orb of influence” they consider close enough to still qualify as a square, but five degrees is quite common. Indeed, by the end of January of 2016, they were still squaring each other with barely a single degree of wiggle room, or 91 degrees. That still constitutes a tight square. Not until the first week of February, did Uranus regain sufficient speed to begin widening the gap. And not until the first week of March did that gap reach a degree and a half. So, if you were feeling the last big squeeze in late 2015 and early 2016, you might have noticed the pressure valve being slowly turned off over the past couple months. When Pluto went into retrograde motion on April 18, we could finally say that the last big squeeze was being relieved. Following a series of seeming false starts, we are now ready for the real planetary shift. The Uranus/Pluto square has flung open the gates to a New Earth, or to many new Earths. We have entered a time of convergence as well as divergence; parallel realities, alternate realities, timelines, dimensions, planets and stars. So much is intertwining at this juncture, and so much is disentwining. We are about to be flung out into what we have labeled our Future. It might help to remember what the Soul intended when embarking on this journey. There was (and still is) a destination or destiny, as determined by the Soul. And yet the Soul is always free to choose a new direction. On A Fireside Chat with Zany Mystic last August, Carla Fox provided some sage advice: Determine in your heart that you want to go home, whatever and wherever that might be for you as a Divine Soul. From there, you can choose from a literally infinite array of options. A significant factor harkens back to the mid 60’s, when Uranus and Pluto were conjunct in our skies. Remember: whatever is birthed at the conjunction is called into action and put to the test at the square. As we gradually put the Uranus/Pluto square behind us, this has a general application, but is especially pertinent for those who were born under the conjunction in the mid 60’s. During the latter part of our current square, Uranus has been forming a quincunx – or inconjunct – to the Uranus/Pluto conjunction. This has been a rather wonky influence, to say the least. As Uranus now eases itself beyond the inconjunct, Pluto is forming a much slower and user-friendly trine to the conjunction of the 60’s. The window for individual, collective and planetary transformation is reaching a new high. Suggestion: Set the controls for Home. Just wanted to give a heads up that my colleague and friend, Elicia Miller is offering a free webinar this coming Wednesday (tomorrow, May 18th) at 1pm Pacific, 4pm Eastern, 9pm UK, 6am (next day) Sydney. If you haven’t caught my December 2015 interview with Elicia, you can still access that talk here. She and I spoke about medical intuitive insights into Candida and Lyme Disease. I have known Elicia for over six years and have had the honor of working with many, many of her clients, so I’ve witnessed the strong support she provides for people both through her free webinars and various levels of group and individual sessions. I also very much enjoyed “One Crazy Broccoli: My Body is Smarter than my Disease,” a collection of empowered healing stories to inspire and uplift people going through chronic health or emotional issues — in which Elicia shares her own healing journey from systemic Candida, emotional eating, addictions and abusive relationships. This latest webinar is called “Express What’s Repressed,” and it focuses on root causes of addictive patterns, core healing and empowerment. For the record, I receive no compensation for posting this announcement. I just like to keep people informed when I know someone’s offering quality work and free information. You can sign up for Elicia’s free webinar by clicking here. Catherine Grace O’Connell is an inspiration and one of the most beautiful people I know, inside and out. I can vouch for the severity of her struggles with Lyme Disease and the intensity of her journey. She has walked through the fire, the eye of the needle, and the Dark Night of the Soul, not only surviving to tell the tale, but shining and inspiring others. I’m so pleased to be able to share this interview with my readers, because so many Chronic Lyme clients ask me if I know of people who’ve actually moved beyond their diagnosis and its myriad symptoms to lead the magical life I see waiting for them to claim. I have lots of incredible, yet confidential stories, which makes me all the happier that Catherine has decided to go public with her journey during Lyme Awareness Month. “This is an interview done with one of the most inspiring women I am proud to call a friend. Catherine is one of the most compassionate, inspiring, generous, loving, kind women I know, and a leader of how to live with chronic illness. I’ve been so fortunate to get to know her personally and despite her own personal battle with Lyme (almost dying and daily seizures) and all that life has thrown at her ~ she is a beacon of light to me and so many others. There are many physically beautiful people in the world. However, when you combine Catherine’s outward beauty with her inner spirit ~ which has such a glowingly beautiful aura ~ and her ability to, not only cope with immense adversity, BUT to triumph with great tenacity ~ AND SHARE all she has learned to help others ~~ you have one immensely powerful leader. I’ve been fortunate to grow personally through following Catherine on Instagram and she has become one of my biggest cheerleaders. She has changed my thinking drastically and not only do I believe I will heal from this illness BUT I WILL TRIUMPH in a way that I never believed or knew would be possible. I’m forever changed by her friendship and spirit. If you’re hurting and go to her Instagram page and just notice gorgeous photos of a beautiful woman ~ dig deeper! Read her quotes ~ read her writings ~ and one day soon, when she shares her full story on her own website you will understand and respect her all the more. I look forward to knowing her full story because from what she’s personally shared with me, in brief format, she has me immensely inspired and motivated to continue to live as passionately as I can WHILE I fight each day AND dream of fulfilling my bigger bucket list (of which I never had before) one day when I’m physically able to. God has blessed me with a friendship with Catherine that has changed my life and I’m forever grateful to her. Catherine Grace O’Connell is a Personal Stylist, and a Lifestyle and Fashion Blogger originally from Lake Forest, Illinois on Chicago’s North Shore. She graduated from Vanderbilt University in 1983 with a double major in Economics and French studying International Finance and had every intention of going to third world countries and saving the world. Catherine went to work in Washington, DC on Capitol Hill for Senator Howard Baker while he was Majority Leader of the Senate. Following his retirement, she went on to work for Congressman Norman Lent before leaving Washington and returning to Chicago to work for a Swiss Bank Corporation in Marketing and Aon Corporation in Sales. Her time on the Hill was quite an exciting one with lunches in the White House Mess, visiting the oval office and a private meeting with Ron and Nancy Reagan at the President’s Dinner. It was a heady time for a sorority girl just out of college. Eventually, Catherine married and had two beautiful children, Maddie and Ryan, who are her pride and joy. Maddie is a 24 year old Actress who graduated from UCLA and lives in West Hollywood and Ryan is a talented musician, who is 22 and in his final year at Berklee College of Music in Boston. To entertain her creative side, Catherine started an Interior Design Business while raising her children. She also began studying spirituality while going through some challenging times in her marriage. Eventually, Catherine left the marriage to start a new life in LA and to obtain her Masters in Spiritual Psychology. After a series of serious health issues, Catherine was diagnosed with late stage Lyme disease and almost lost her life to the illness just over a year ago. In her own words Catherine has come to know that: “Life threatening illness has a way of changing people at their very core and that is certainly my story as well which lead me to reigniting my passion and my purpose.” Read on to find out more about Catherine and her work. Tell us about your work as a personal stylist and your journey so far. This is a relatively new journey over the past few months beginning with this foray into the Instagram world. The reception that I have received has been overwhelming. I have to admit entering the blogging world in my mid fifties while most bloggers are closer to the age of my daughter initially felt a bit intimidating. I tend to be very creative and not very technological. I love playing around with patterns and colors. I believe that there aren’t any rules when it comes to fashion. My personal styling business is more about assisting women to see their inner beauty, what I often refer to is helping women to put on their “infit” before they put on their outfit. I love helping women to adopt a beautiful mindset. I have been on a deeply spiritual path for much of my life having overcome a great deal of adversity as have most women by the time of midlife. I practice yoga and meditation. I am also a Reiki Master Teacher and have been trained in many healing modalities. I bring a lot of spiritual inspiration into my personal styling and fashion blogging as it is truly my passion and purpose in life to inspire others along the way. Was this always what you wanted to do or did it emerge over time? I was a very sensitive young girl. I always knew that I was different in some way. My heart truly hurt seeing the disparity in the world and I wanted to make a difference. I spent a lot of time volunteering growing up. I worked in old people homes and hospitals. Later in college, I volunteered tutoring women in prisons. I desperately wanted to help. My love of fashion was very much alive although I had little money to buy beautiful clothing. I remember my first pair of jeans were my brothers hand me downs. As soon as I was old enough to work, I began to earn money so that I could buy clothes. I worked in factories, delivering telephone books, bagging groceries, you name it and I did it. Soon enough, I would take a bus to the mall to work at Charles Stevens for the discount. Over time, I began working at Neiman Marcus and Saks Fifth Avenue. I was offered a Management position at Neimans having been the number one saleperson. Yet the messages were so strong to get a “real job” and so, I went on to work in Washington and Swiss Bank to get on the career track as I was “supposed to do.” I had a real job at the cost of my passion as so many of us do in life. It took me another thirty years to reconnect with my passion. What and who has helped you in the process of following your dream? There’s an interesting story behind the beginning of this business. In the spring of 2015, I was still bedridden with Lyme disease. I spent a year with daily seizures, making walking extremely difficult. It had been the most difficult year of my life as my I dropped down to almost 100 pounds and my organs began shutting down. I went through a near death experience where I left my body and had to make a decision on whether or not to come back. Somehow, I made the decision to return, yet I didn’t understand why, as I was suffering immensely. One day, last spring while still bedridden, my daughter had a life changing conversation with me. She asked me what I would do if I were well. I told her that I would travel and write my story. I began creating bucket lists. Well, that soon became a fashion blog as I went online and began dreaming and scheming. I began visualizing. I began living in that space. And, I began healing. Quickly. And, before I knew it, I was off doing photo shoots. I had no idea what I was doing. It had been a very long time that I had been in front of a camera. I certainly didn’t know a thing about editing and I had never been on Instagram. I created an Instagram account. I pulled out my iphone and handed my camera to friends and family. Over time, I recruited a close friend who taught himself how to take photographs and how to use Lightroom and Photoshop. I invested in a really good camera and an expensive lens. I started reaching out to various brands that I loved and they responded. And, I began a personal styling business with an emphasis on helping women to connect with their inner beauty. For the first time in my life, I began doing things that made me happy. Women of all ages inspire me. Women with a strong sense of self and a strong faith inspire me. Women who have overcome adversity inspire me the most. I consider myself to be very spiritual yet not religious. I am open to all faiths and belief systems. I tend to be very Buddhist by nature. I adore the Millenials and greatly admire their strength and dedication to protecting our environment. And women of midlife, or as I like to call it, Act II, my hats are off to all of you. To me, by the time most women have hit midlife they have had to overcome difficult challenges by turning within. It is those inner resources that are immensely powerful and to me that is what ultimately determines a woman’s strength and beauty. What challenges have you encountered and how have you overcome them? Like so many women my age, I have encountered many challenges throughout my life. I haven’t yet shared my story publicly. I was diagnosed with PTSD, having survived some pretty severe trauma and abuse. The details are not what is important. I have learned a great deal through this journey. As I have shared with the many friends that I have made within the Lyme community, I have received many blessings through this illness. I will be perfectly honest that the suffering with Lyme disease is absolutely beyond anything I could have ever imagined. Yet, it is almost a way of the Universe forcing you to turn within and to shine a light on those dark places inside of us. It has helped me to be even more empathetic and compassionate. To open my heart even more. It also helped to light a fire inside of me to ignite my passion and my purpose. I literally watched myself come alive through aligning with my true passion and truly believing in myself. It takes a lot of guts at the age of 54 to jump into the Instagram Fashion Blogging World. What message are you trying to share with your work? The message at the core of everything that I do is to Believe in Yourself and to Love Yourself. Beauty is truly on the inside. I was always told that I was beautiful when I was growing up by not by my family. It didn’t matter how others saw me. What mattered was how I “felt”about myself. The messages within my family were quite critical and so that was what I believed. Those messages literally affected me and my beliefs about myself. They changed me at my core. I didn’t understand that the messages had nothing to do with me. I took on other people’s projections as my own. I then married a man, and I left the marriage in a million pieces. I had to take responsibility for my own empowerment. The most important thing for a woman is how she chooses to feel on the inside. Life responds from there. To me, that is what fashion is all about. Fashion instantly changes how a woman feels. When we change how we feel. We change how people respond and our life changes. How did you learn to deal with criticism? It is a continual learning process. What I have learned is that everyone is a mirror. In other words, when I am angry at someone, I need to look at myself. For example, this was a difficult week for me. I had a lot of emotion come up with a situation. I had to take responsibility for my anger and what was triggered inside of me. It is never about the other person. It always comes down to you. If someone criticizes you, and you react, then it is up to you to look within to see why you were triggered in the first place. As they teach on the spiritual path, if you are truly peaceful within, it isn’t possible for criticism to trigger you. So, the answer is always within. It is never outside of you. The journey truly never ends. What is it that you love about living a creative life? It is so interesting as people have always described me as a creative and I tended to discard that label. Now, I see that as so true. I was the child who was always rearranging her bedroom. What I find now is that even when I’m having a bad day with the Lyme, when I do a photo shoot, I’m in a different place. It instantly changes my energy. I’m happy, joyful and playful. With Lyme disease, I don’t get a lot of sleep. I can look tired with bags under my eyes and they seem to go away when we begin shooting. I tend to be very holistic and natural. I have found that reconnecting with your creativity instantly reawakens joy making you look beautiful. Don’t wait. It is truly never too late to get started. Your heart knows. Turn within and listen. Then just do it. What advice would you give yourself if you could go back? I would hug that little girl and love her. I would let her know that she had it all right all along. She had all the answers within. And I would tell her to not be afraid and to go for it. Follow her dreams and to not look back. Trust. Trust in the Universe. What are you most excited for in the future? I am excited that I have a future. Just over a year ago there was no future. The greatest challenge with a chronic illness is that it becomes a part of your being. The danger is that it becomes your story. I am consciously choosing each day to live in a new space and I’ll be honest, it’s not easy. To live in a place with hope and new beginnings is a conscious choice I am making each day. To live as “Catherinegraceo” and to hopefully inspire others along the way. I want to thank each and every one of my Followers on Instagram. You have no idea how much you and your comments inspire me. You all are truly the reason that I am here today. Just a reminder that today is the last day for the early prepay discount for the June 11th Special Topics in Reiki Class: Deepening Your Experience of the Distant Healing Symbol. There’s still some space in this class, but today’s the day if you’d like the discount. Please contact me by following the link or send an email to brunoleaf at yahoo dot com expressing your interest. You must have Reiki 2 or higher certification (from me or someone else) in order to take this class. Half hour tarot readings at 20% off the usual rate. Tarot readings offer an energetic check-in, the chance to ask questions about pending decisions or intentions, and represent a fun, yet powerful way to gain new perspective on relationships and challenges. This past weekend, David and I took a mini-getaway for his birthday. Our ultimate destination was Turkey Run State Park in West Central Indiana, but we decided to go via Lafayette, home of Purdue University — mostly because it afforded the most gluten-free, organic and/or vegan dining options. I had read that Lafayette and West Lafayette have the highest density population of anywhere in Indiana, so we prepared ourselves for hustle bustle, despite our intention to relax and go with the flow. After years of caring for David’s parents and more recently my own, this was our first non-family, non-must-do-event getaway in as long as we can remember. No plans other than a 6:45 dinner reservation at Restauration and prepaid hotels in Lafayette on Saturday and at Turkey Run Inn on Sunday. Imagine our surprise when we arrived in Lafayette to find it almost completely deserted. Purdue must be out of session, because we saw hardly any students and even fewer adults. We actually referenced the Twilight Zone on several occasions, because the streets were that empty! We checked into the Baymont and received an immediate upgrade to a corner room with a king bed. We had stocked up our cooler for the rest of the trip at the Mishawaka Whole Foods (which David helped open in 2013) and planned to wander around Lafayette art galleries and quaint shops, but we found most of them closed. With unexpected time before our dinner reservation, we headed over to Clegg Botanical Gardens, just outside of town. Reviews warned that it was more of a “nature trail” than a formal European garden, but that suited us just fine. The hills and dramatic views of Wildcat Creek cleared our heads and made me smile. Although we only spent about 20 minutes on steep steps and a winding trail, we felt the industrial views and dilapidated buildings of our trip there — and daily life in Goshen — fade away. I felt water begin to pour into my soul. When we arrived back in Lafayette a mere 45 minutes later, the city suddenly seemed fully inhabited! Nary a parking space anywhere. All the restaurants were full, and we needed to tap our parking angel connections to make our reservation on time. More Twilight Zone jokes: when did they all land? As became a theme on this getaway, we got seated in the furthest away corner table, snugly tucked into our own universe. We enjoyed the food — mostly local, mostly organic/heirloom, with numerous vegan and gluten-free options, organic hard cider, and homemade bread from Einkorn wheat. It didn’t knock-our-socks-off, but we didn’t care. As we decompressed over dinner, we realized just how difficult the past three years have been for both of us, and we realized that we have made it through. We can feel the restoration after a very long time in the Wasteland. I mentioned to David how many synchronicities I’ve had lately surrounding the Grail story. It seems everything that crosses my path somehow references the tale in new, deeply resonant ways. Sharon Blackie’s book, “If Woman Rose Rooted,” explores this ancient Celtic story in both its sanitized and Christianized forms, as well as its wilder forms — recognizing the Wasteland of what humanity has done to our Earth and our responsibility (and ability) to re-enchant the world. I highly recommend this book for both men and women, btw, since it reveals how the sacred masculine needs the divine feminine principle in order to return to its own balance. Sharon’s book interweaves her own story with that of many inspiring and deeply rooted women. Various iterations of the Grail story punctuate the cloth like repeating jeweled colors and patterns of a rich tapestry. In any case, I fell asleep on Saturday night after reading another Celtic retelling of the Grail with women as its sacred protectors … and with its mythological connection between abusive, disrespectful patriarchal leadership and barren land. So often when I look upon the once tree covered Indiana, my heart and soul weep for this very same situation. Our world faces so many ecological crises, but the flat, industrialized, blight ridden, grey, dilapidated, toxic and ugly assault me whenever I leave my faery haven cocoon. Fortunately, the restoration of our Land continues, inspired by the complete contrast and a sense of urgency that I feel bubbling up not only from my soul but from the Land itself. Because we live in a beautiful little house, with a beautiful and colorful magical office house next door and beautiful, lush, abundant gardens everywhere around and in between, I tend to lose sight of what I’ve done in three years. Only when I leave this sacred, healing spot does the harshness of Northern Indiana yank the magic carpet from beneath my soul until I remember that I’m the one who flies. I’m the one restoring this land, nurturing perennials, bulbs and fruit trees, planting native wildflowers, and designing sacred”rooms” inside and out. Our drive to and around Lafayette reminded me, yes, of what feels so offensive to the inner artist in me, but it also registered possibilities. As we drove through neighborhood after gardenless, unlandscaped neighborhood, I began seeing gardens everywhere. “Do you realize how beautiful this world could be, David?! Do you realize how much food we could grow and how lovely it would all become?” When he mentioned poverty of both pocketbook and spirit, I wondered aloud, “Yes, but what if those come from a lack of imagination, a lack of vision? What if planting flowers and throwing colorful paint on old buildings could charm the poverty away? What if getting hands in the dirt really did heal depression like scientific studies continue to show?” Re-enchantment. The next day we drove the hour to Turkey Run State Park. It was too rainy to go to the reportedly quieter Shades State Park, since that one can become treacherous in wet weather, so we got to Turkey Run Inn early. Once again, we found our room ready and tucked away in a quiet corner. My friend Dana from The Druid’s Garden had told me months ago that she had experienced one of the most sacred spots on Earth ever — not just in Indiana — at Turkey Run, and my soul hungered to feel in real life (not just my imagination) that deep, restorative healing it craved from Nature. Despite all my gardening –and in all our travels I discovered that I actually have the most extensive garden I’ve seen for hundreds of miles and many towns in multiple states– I frequently feel starved for Nature in Northern Indiana. Instead of receiving from the Earth as I have in so many of my homes, with few exceptions, Goshen feels like everything I enjoy here, I made or co-created myself, usually through passionately love-filled vision and hard work. People appreciate the effort, but I knew I needed to replenish all the energy going out of me since we moved here in November 2 012. For months, I’ve anticipated this trip, expecting to feel cleansed by Nature’s holiness. We arrived on Mother’s Day, which was maybe not the best planning, but synchronously, this experience triggered massive downloads and focus, so no mistake. When we began our hike, I immediately noticed the crowds. I don’t do crowds, so they seemed even larger than they probably were. At first, I assumed my ears deceived me about the volume of noise. “Don’t be so picky, Laura, that’s just a bird squawking in the distance. Nature’s not silent. Try to enjoy all Her creatures.” As we continued our walk, though, I found that in fact, those squawks were not birds, but children. Shrieking, yelling, rambunctious kids. The sign’s reverence for the unique and sacred aspects of this park warmed my heart. Instead of simply saying, “Stay on the trails,” the sign explained how “the greatest threat to this 20,000 year old preservation is you,” going on to note how park visitors’ actions can change the delicate balance required to maintain this Land. In addition to not trampling delicate flora, signs carefully explained all sticks should be left in place to decompose and add to the soil’s fertility. With that in mind, we turned a curve to find the source of much of the squawking. Pre-teen boys covered in mud ran recklessly around a bridge and stream. They had huge sticks and smashed them — loudly and aggressively — in the water, while their father egged them on. Passersby with children allowed their own children to join the fray, climbing boulders and shouting from the top, splashing mud on themselves and others, yelling to each other from dozens of yards away or up close. Volume had nothing to do with proximity. I covered my ears and tried to identify one set of parents to connect with to begin to turn the tide, but the volume continued to rise and rise until my head began to spin. “This is worse than a Walmart,” I said to David. “It’s like screaming in a cathedral,”I whispered — outraged, as I knew we just happened to be standing right in the most sacred spot that Dana had mentioned. It looked truly magical. How could these children and their parents be so oblivious to the wonder here?! “It’s Mother’s Day,” said David, hopping off to take some photos. I continued covering my ears, because the sounds of the yelling echoed in the canyon walls, amplifying each voice as more families began to arrive and thoughtlessly smash sticks on the rocks and water. It was the first Mother’s Day I’ve ever pondered the virtues of population control and plagues, and doing so felt as horrible as the shattered dream of sitting near a waterfall or spring and just communing with our real Mother … Mama Earth. Seriously, how could so many people come to such a gorgeous, sacred place and desecrate it? I’m usually so optimistic about humanity’s ability to turn things around, but I began having serious doubts on Sunday. Thankfully, David insisted we keep walking, even when that walk turned to the “rugged” portion of the trail. I was so frazzled from the shouting that I did not trust my balance on a slippery, narrow rock ledge covered with moss, but my Taurus David had set his mind on reaching “The Punch Bowl.” I could either remain at the bottleneck of screaming, splashing pre-teens, or I could slip and slide my way through to the next phase. I used to rock climb, and those skills returned as the waterfall’s roar covered the human shouts. David went down to the Punch Bowl, and I climbed up a path to sit at the top of the waterfall he wanted to photograph. While there, the water washed away my earlier frustration and soothed the raw nerves. A warbler began to chirp on a nearby tree, and from the spring that fed the waterfall, I felt a strong Mother presence holding space for me, as my soul unwound. Un-twined, but also unwound as in un-wounded, un-hurt itself. I felt my soul heal by those holy waters. Having passed the slippery threshold, we agreed to walk this longer, more rugged path in order to experience the quiet restoration we came here to receive. The rest of the journey did not disappoint, and several historical markers along the way revealed that the horror, outrage and sorrow I felt at desecrating the sacred actually helped to birth this park and the entire Indiana State Parks System. I found communion with the humans who recognized the beauty and power of this place and who did something to preserve it. Perhaps I will tell that story in depth another time, as this post grows long, but suffice to say, the people who created and maintain Turkey Run State Park are deeply reverent, soulful beings who honor the Waters and the Land. I felt humbled and inspired. We returned to our room for a snack and lazy afternoon nap, then wandered out to Sunset Point at day’s end. I expected to find a crowd there, too, but David and I found ourselves alone with the woods, taking a magical walk at twilight. I immediately presented my own need for healing as it relates to healing our Land in Goshen, and then Indiana at large. This state once housed the most magnificent trees! If not for people like state parks creator Richard Lieber and writer and activist Juliet Strauss, the rest of Indiana might have fallen to the timber companies devouring everything in sight. If not for those of us in Goshen loving the Land, planting trees, supporting the farmers market and creating and supporting the Arts, Goshen would not be bubbling forth with new, fresh waters of life. If not for people doing similar things in other spots, our entire Earth would turn into corporate cookie cutter buildings, ravaged land and poisoned wells. Indeed, the Grail is present within the Wasteland, pouring healing waters upon the Land. May we each do our part to restore and re-enchant the Mother we all share.